Want to know more about Hong Kong tailors? How Much for a Suit/Shirt Made by Hong Kong Tailors? A tailor-made 2-piece suit made by Hong Kong tailors start from just US$250-300 up, and shirts starting from US$35-40 up each; tailor-made shirts generally start from US$35-40 up each. How Long does it Take to Have a Tailor-Made Suit be done? Hong Kong tailors can deliver the final products in just a few days. You will need to go to the tailor shop for 2-3 times. First time is to get measured up, second time for first fitting, and third time for final fitting and take the products home. Sometimes you can even take your suits home without second fitting. Shop Locations – Where are the Tailor Shops in Hong Kong? There are over 400 tailors in Hong Kong Island, Kowloon, and the New Territories. Most tailor shops are located at Tsim Sha Tsui, and Central/Admiralty CBD. Which Tailor to Visit – Any Recommendations? There are over 400 tailors in Hong Kong, some offer 2-piece suits at US$250-300, premium suits can start from US$2000-2500 and up. So the first thing you should ask yourself is your price budget. Tailor-M.com as a resourceful guide. 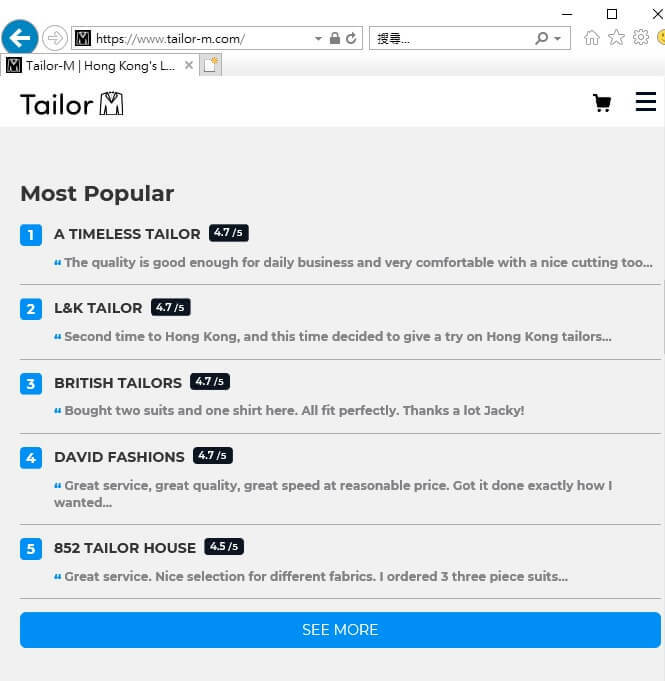 You can filter Hong Kong tailors by price range, and also by district (www.tailor-m.com/tailors). 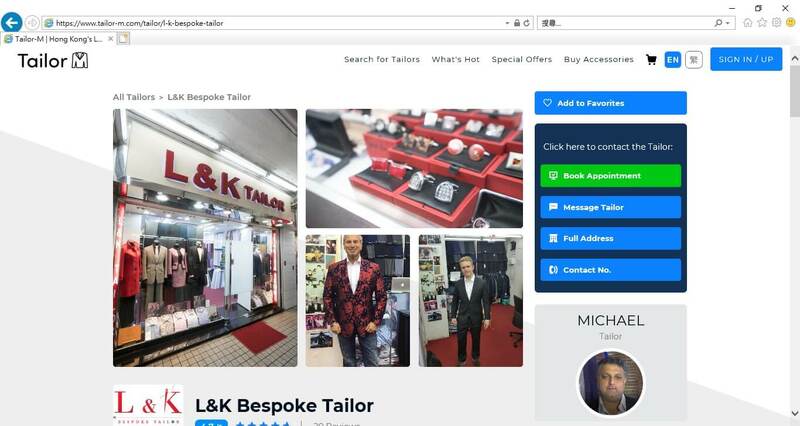 You can find a lot of useful info about the tailor shops on Tailor-M.com, such as opening hours, shop address, contact info etc. 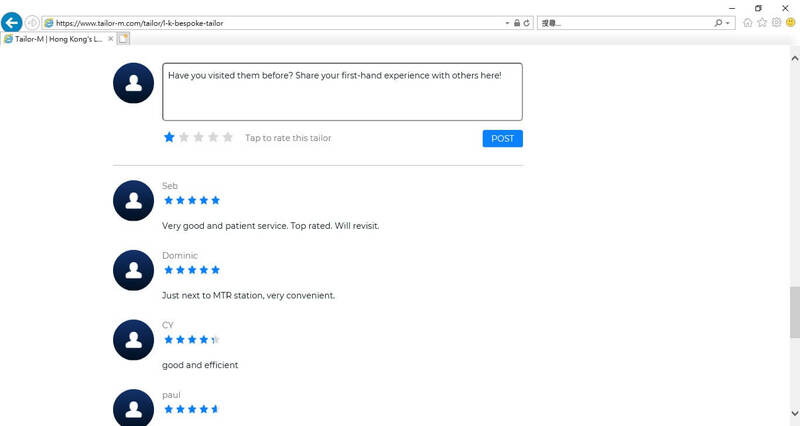 And don’t forget to check their customer reviews – get to know the shopping experience of past customers – have a sense of their products’/services’ quality. Once you find out your preferred tailor shop, remember to make appointments prior to visiting their shops. This is because most tailor shops in Hong Kong are family-run businesses, tailor shop owners (who are the most experienced ones) are responsible for off-site measurements, buying fabrics from suppliers etc. There is a chance of no one in the tailor shops if customers haven’t made appointments in advance. 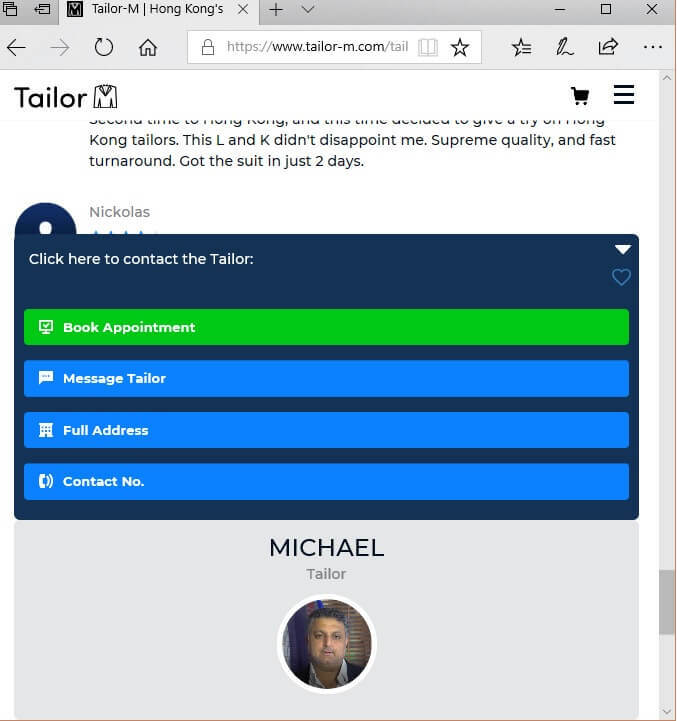 You can make appointments with Hong Kong tailors through Tailor-M.com by simply a click. Once you select your preferred tailor, you can make appointments with the tailors by choosing the time and date. You can make remarks (e.g. special requirements on fabrics/ production time). Some Specific Questions to Ask the Tailors? Drop a message to individual tailors using the “Message Tailor” button. You can ask about, for example, the availability of certain fabrics, delivery/order arrangements for overseas orders/repurchases etc.